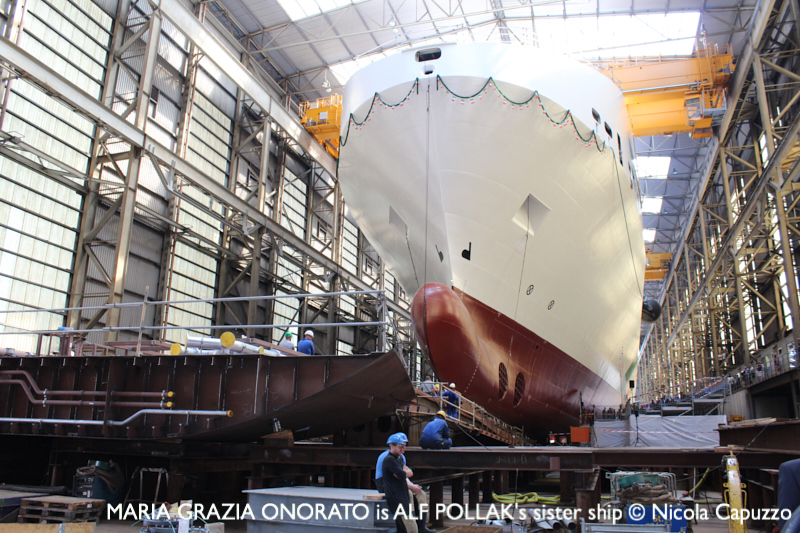 Onorato Armatori of Italy, controlled by Vincenzo Onorato, head of Moby group, publicly announced that the new ro-ro ship ALF POLLAK will be chartered out to a company based in Northern Europe, instead of being deployed in the Med as previously anticipated. The charterer will be Cobelfret’s Cldn, which offers regular connections from the European continent to the British Isles, Scandinavia and Spain. The contract is for one year. ALF POLLAK (capacity for 310 semi-trailers on 4,076 lane meter of garage deck) has just been delivered in bare boat charter to Onorato Armatori by the German shipbuilder Flensburger Schiffbau-Gesellschaft trough SIEM Group and is currently installing the scrubbers at Fayard shiprepair. Onorato Armatori said in a statement that “the ro-ro market in the Mediterranean is not mature enough to receive such a big ro-ro vessel with a capacity of over 4,000 lane metres”. What will happen with the sister vessel still under construction (photo) remains to be seen.